Tight sealing techniques. Each rigid insulation panel is sealed to attic framing and to neighboring panels. The result is a thick, uniform layer of insulation that includes a radiant barrier for additional energy savings. Developed by energy performance experts at Dr. Energy Saver, the SuperAttic™ system is an innovative alternative to conventional attic insulation techniques. While not suitable for all attics, the SuperAttic system is an excellent solution for unfinished attics that are fully or partially floored or used for storage. The attic is always the most important “target” for air-sealing and insulation upgrades Making a house as airtight and well-insulated as possible is essential if you want to cut heating and cooling costs. This sealing and insulating priority is more important in the attic than anywhere else in the house. However, it’s not always easy to add more insulation in the attic. For example, many attics in older houses have flooring installed, so that the attic space can be used for storage. The SuperAttic system allows the attic to be sealed and insulated without losing this storage space. 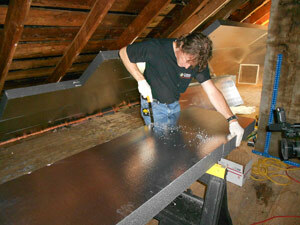 Installing a SuperAttic system in a typical house usually takes just a day or two. To install the SuperAttic™ system, technicians fasten proprietary rigid foam insulation panels directly beneath the attic roof rafters and against the gable end framing. Joints between rigid foam panels are sealed with spray foam sealant and aluminum tape. The end result is a continuous air and insulation barrier with no thermal bridging to compromise energy performance. The SuperAttic system maintains roof ventilation between rafters, but without allowing exterior air to enter the attic space. As an added benefit, the rigid insulation panels include an integral radiant barrier that further reduces heating and cooling costs. Rigid foam insulation will not shrink, outgass or lose R-value like other types of insulation. Integral radiant barrier reflects summer heat out and winter heat back in. Ensures top performance of ductwork and other HVAC equipment located in the attic. Dr. Energy Saver invented the SuperAttic system to overcome common attic insulation and air-sealing problems and offer homeowners a high-performance alternative to blowing fiberglass or cellulose insulation into attic spaces. The SuperAttic system has already drawn praise from customers who are enjoying vastly improved energy performance along with attic storage and the system’s neat, clean appearance. Dr. Energy Saver services, Bridgeport, New Haven, Hartford, Stamford, Waterbury, Norwalk, Danbury, New Britain, West Hartford, Bristol, and surrounding areas. Contact us today for a Free Estimate.